I'm a monthly blogger over at the Ploughshares blog! And my fourteenth post is now up: an interview with Erín Moure [photo credit Mélodie Inouie] on translation. You can see links to all of my Ploughshares posts here, including interviews with Montreal writer Jacob Wren, Toronto poet Marcus McCann, founder/editor Robin Richardson on Minola Review: a journal of women's writing, Toronto poet Emily Izsak, Ottawa poet Faizal Deen, Parliamentary Poet Laureate George Elliott Clarke, editor/critic Erin Wunker, Arc Poetry Magazine Poetry Editor Rhonda Douglas, editor/publisher Leigh Nash on Invisible Publishing, Cobourg, Ontario poet, editor, fiction writer and small press publisher Stuart Ross, Toronto novelist Ken Sparling, Kingston writer Diane Schoemperlen and Toronto poet Soraya Peerbaye. Ayesha Chatterjee’s poetry has appeared in journals across the globe and on the official website of Canada’s Parliamentary Poet Laureate, George Elliott Clarke. Her second collection, Bottles and Bones, is new from Bayeux Arts. She lives in Toronto. My first book, The Clarity of Distance, changed everything! Suddenly, I felt that I could confidently call myself a poet, because I had a tangible book in my hot little hands as proof. I could apply for membership at—and was accepted into—the League of Canadian Poets, which was hugely exciting to me. Clarity was also my ticket to reading at IFOA’s 2012 Battle of the Bards at Harbourfront Centre. That was my first ever poetry reading in Canada—how cool is that? Bayeux Arts, the Calgary-based indy press that published Clarity, has also just published my second collection, Bottles and Bones. I feel as though my work has become more expressionistic in the six years since Clarity, a little more abstract, but that could just be me. The lead-up to publication has been a bit terrifying, to be honest. A first collection is pure joy to have out in the world, especially for someone like me, who was a complete unknown in Canada, having arrived in this country just a year before The Clarity of Distance was released, and not having had anything at all published in Canada previously. This time around there are Expectations. Or something. But it’s out now and I’m giddy again with excitement, because now it will take on a life of its own, really. I’ve been writing poetry since I was about nine years old. It’s the genre I write in most naturally. I’ve tried writing fiction. I wrote a whole novel over five years and found it very painful to write. I only realised why it was so hard to write after I finished it. It was because I’d approached it like poetry, which didn’t work very well in this particular case. It kind of depends on the poem. Sometimes a poem almost writes itself and other times it takes a few days for it to form. My first drafts ARE my notes. I start with whatever (sometimes rubbishy) thoughts I’ve jotted down on paper and then edit and edit and edit them down. Most of my poems are very short and what you’re seeing is often maybe a third of what I started out with. It has always begun with a poem. And a poem can begin anywhere, with an image, a line or an idea. I enjoy being in front of an audience and reading my poems to them, it’s intoxicating. But the lead up is a little scary, like stage fright. Which is a good thing, because it means I always prepare in advance. My creative process isn’t really affected by public readings. In my head the two things are unrelated, almost. I write for an imaginary reading audience (myself, usually, and I’m hyper critical), not a listening audience. What I find difficult is writing in a group, because, invariably, I will write specifically for them, which can be counterproductive, because it’s not always truthful and that’s dangerous. I am embarrassed to say, I have no idea what the current questions are. I’m confused enough as it is. If I thought my writing might influence culture at large, I wouldn’t be able to write a word, I’d be a complete blank. Speaking only for myself, I write in the hope that my poems will get readers to stop and look at their world differently, even if just for an moment, or will resonate with them in some way. That’s cliché, I know, but it’s the truth. It’s what good poetry does for me and I’d like to give some of that back to the world. Both. It’s absolutely essential to work with a good editor in terms of objectivity and to tighten your work, but I sometimes find it very difficult to translate good advice on a working draft into good poetry. Not always, of course, and then it’s magic! “You gotta have a dream, if you don’t have a dream, then how you gonna make a dream come true?” From the South Pacific song ‘Happy Talk’ by Rodgers and Hammerstein. I write best in the mornings, when my head isn’t yet filled with all the day’s distractions. I try to carve out three mornings a week to write. I’ve got a little writing nook with a secretary desk at right angles to a window that looks out onto our patio so I can see it when I turn my head. I usually start at around 9am after I’ve had breakfast and my second cup of coffee, and I’m there till lunch. Oh my goodness, what a perfectly timed question! Bottles and Bones is all about fragrance and the sense of smell or lack thereof. And the very last poem in Clarity, called Physics, mentions exactly that—petrichor, the fragrance of rain on dry earth. In India, there’s a perfume distilled to mimic it. It’s been made for thousands of years and is called "mitti attar” or attar of earth. I often say that I write poetry because I can’t draw. Visual art is a strong influence as is music. I used to want to write a musical. Maybe I still will someday. Emily Dickinson is probably my biggest influence. Also Thomas Hardy, Robert Frost, Jo Shapcott, Elizabeth Bishop, James Joyce, Virginia Woolf, Kamala Das, Alfred, Lord Tennyson. Write that musical, now that you’ve reminded me. I can’t think of anything else I’d rather be. Honestly. This is what I’ve wanted my whole life. I don’t feel as though I had much choice in the matter. Writing is like an addiction. If there’s a long period of time where I’m not writing, I start to feel increasingly uneasy, even guilty, and writing is what gets me back on an even keel. The Romantics by Pankaj Mishra. The South Korean film Poetry, written and directed by Lee Chang-Dong. Promoting my new collection, Bottles and Bones. The day was bright. We saw where the water stopped rising by the marks on the vinyl siding. The raccoons had all come down from their trees, but no one could say where they had gone. On our walk, we found a truck tire welded to the riverbank. The water beside it was a silver ribbon. It was doing its best impression of something that would not chew holes in the railbeds and cover the town with a fine patina of river mud. It was “bucolic,” the word the realtors used, convincing us to build here—beneath the trees that never burn, the sky that is ever blue. 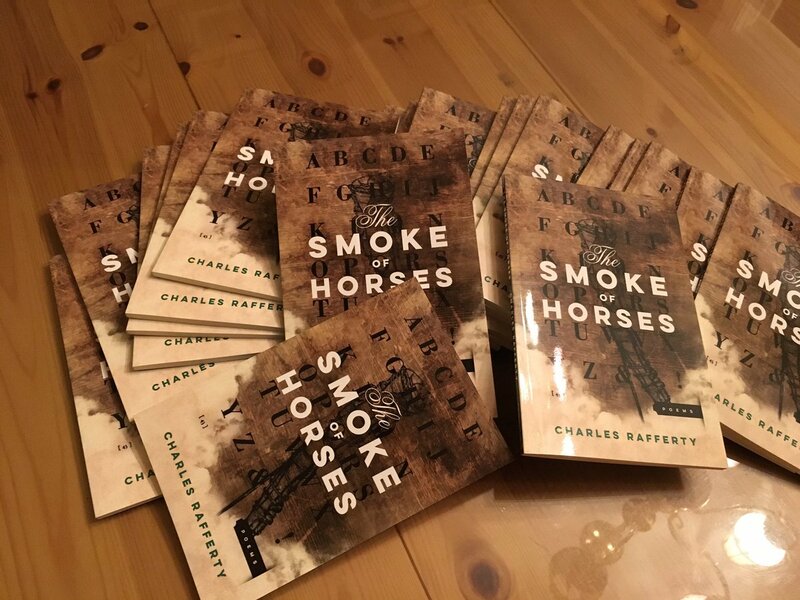 And yet, Rafferty’s The Smoke of Horses occupies the same stylistic and structural territory as the short story writer Lydia Davis (who provides a quote on the back cover of this collection). How is one considered a short story writer while the other is considered a poet? Is this a territory where the naming of genre is as fluid as their lines? After the invaders entered the palace, they dragged the great tapestries down. They cut them apart as they called for beer, and the queen was made to serve them without taking off her crown. Later, she gathered up the scraps and took them to the stables so that she might end the shivering of her enemies’ horses. See his previous interview in the same series, on his Murderous Signs (2000-2007), here. 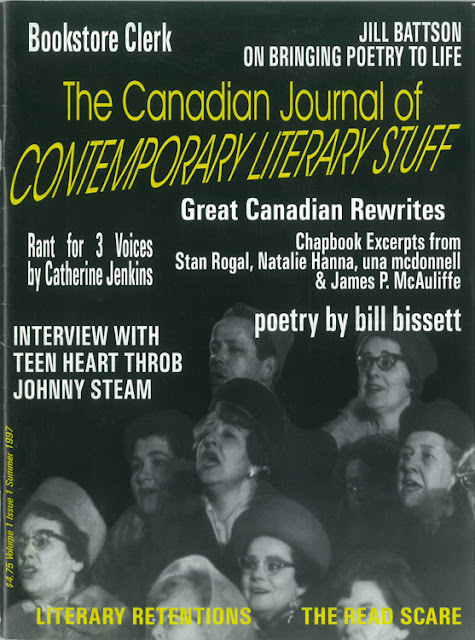 Q: How did The Canadian Journal of Contemporary Literary Stuff first start? A: Once upon a time, Tamara Fairchild and I were members of a writers group that had grown up amongst a circle of our friends. This group rolled happily along for a while – it was at least as much a social thing as it was a literary thing – until somewhere along the way someone had the idea that we should put out a little journal as a vehicle for our writing. The first issue of MPD, as we called the journal (the conceit being that what the letters stood for would change with each issue), came out in 1993. It was very much on the standard photocopied & stapled “litzine” model, though I don’t think any of us would have known that term at the time. We initially had only the vaguest notion that there was a local literary world out there to be part of. Although we tried to streamline the editorial and production process for MPD after the first one – there was a rotating editorial board of different members for each issue – ultimately, it was an integral part of the writing group’s identity that the whole thing had to function as a democracy. Not surprisingly, with a membership that ranged between nine and at least thirteen people over the years, both MPD and the group itself could be pretty slow moving projects, with things often only seeming to get done after much debate, and at the speed of the slowest, least interested, or otherwise most distracted person involved. Anyway, Tamara and I had been friends for a good while before all this, and we ended up working together as the editors of the 2nd issue of MPD and then again on the 6th issue – so by the time we were finished putting out #6 we knew that we were on the same wavelength about a lot of things, and that we worked well together. After the 6th issue we also knew that because of the democratic “everybody gets a turn” nature of the project, we probably wouldn’t be doing another one for at least a couple of years. At that point I think we both just realized that we had bigger literary ambitions than what MPD and the writers group was going to allow for – and so we decided to strike out on our own. Q: How did this translate into The Canadian Journal of Contemporary Literary Stuff? A: Deciding that we wanted to do our own thing was obviously the first step. Once we’d gotten that far, I think we focused in on what we saw as the need for a strong editorial presence in our (soon-to-be) magazine, and on setting it up to be – at least in part – a platform for engaging with and looking at the larger literary landscape. One of the things we’d noticed through our ongoing involvement in the literary world was that few of the literary magazines, journals and zines we’d encountered seemed to have much of an identity beyond being the sum of their contents. There wasn’t very much in the way of editorial presence out there, and even less of a sense that anyone stood for anything or was interested in anything beyond the poetry & prose being printed in a given issue. It all seemed to be so humourless too – like latter-day manifestations of those stories we all read in our high school Canlit English classes, where noble prairie-folk trudged off into snowstorms to die. So, while we certainly intended to publish good work in our magazine, we also thought that the literary culture in which we resided was worth looking at, talking about and maybe even showing off. 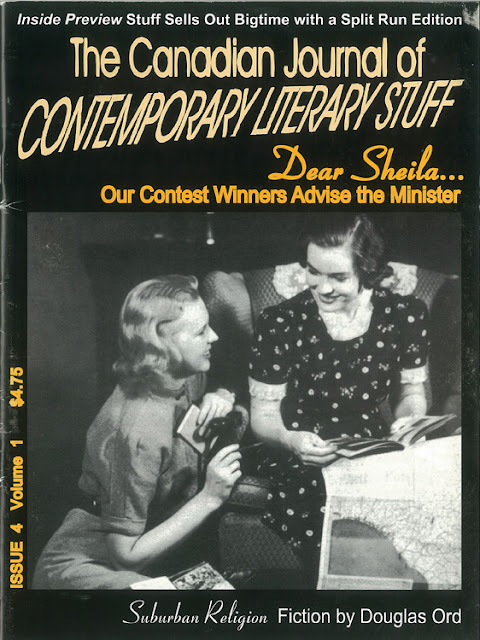 I think we figured that if we could do this with a sense of fun and a certain level of capaciousness, we’d have a magazine that could be enjoyed by – and have something to say to – anyone with a modicum of interest in things literary. The first and most obvious manifestation of this ambition was that the magazine would have to be as big and glossy – as close to a “real” magazine – as we could make it, and that we would have to get it properly distributed. If we wanted to invite the larger culture into our corner of the literary world, we had to be something that looked like it belonged on that larger culture’s magazine rack – and then we actually had to get it onto those magazine racks so that the larger culture could find it. Like I said, we had big ambitions. Q: How was the first issue put together? Did you send out a call for submissions, or were you predominantly soliciting? A: In terms of pulling together the content for Stuff, we tried to have it both ways. We’d given ourselves a lot of time to put the first issue together – the magazine would be ready to go when it was ready to go, basically – so we had time to do a pretty intensive mail-out of our call for submissions. But we also hit up our literary friends, acquaintances and people we knew whose work we admired. This part of it was especially important right at the beginning, because we were looking for recurring features – comics, comment, columns and such – that we could run in every issue. We really did want the magazine to feel like it was an ongoing conversation with and about the literary world – and this was something best arranged with writers whom we knew well enough to know that they would have something to say, and be able to say it on a semi-regular basis. As it happened, Tamara ended up moving from Ottawa to Toronto almost immediately after we’d decided to start Stuff. Though this initially worried us a little in terms of communication and logistics, I think it quickly turned out to be a very good thing, as it meant we were physically present in both cities, and involved in both literary communities. Tamara was very much a practicing poet at the time too, and quickly got involved in the Toronto poetry world, which meant that we soon ended up with a lot more personal contact in that scene – the centre of the Canadian literary universe – than we might otherwise have had. Q: How did that personal contact translate into what appeared in the journal? 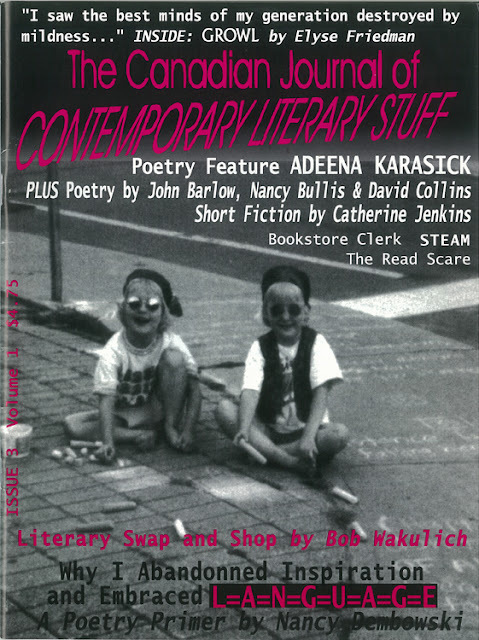 A: It seemed to work out that people whom we had come to know and like and whose writing we admired from the Ottawa literary scene ended up as recurring contributors to Stuff, writing regular columns or otherwise being generous and flexible with their work when we asked for it. This would be writers like James Spyker and Catherine Jenkins, and Chris Pollard and Natalie Hanna, amongst others. Of course, we were already familiar with the Toronto literary scene when we began putting the magazine together – we’d gone to small press fairs and Canzine with MPD, and there was generally a fair bit of communication between the Ottawa and Toronto poetry worlds. James and Catherine had already moved there by that point too, so we did have some points of contact there. 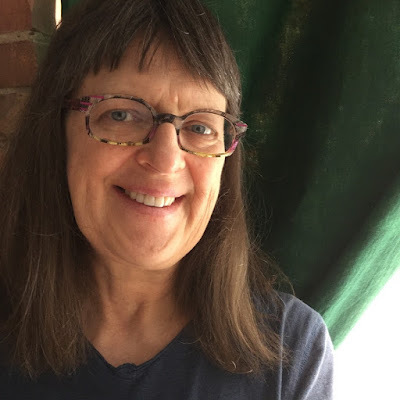 Tamara, as I said, was very much a practicing poet in those days, and got into the Toronto literary world pretty quickly once she made the move herself, meeting and becoming friends with people like bill bissett, Jill Batson, Nancy Dembowski and Lil Blume, amongst others. A lot of the literary friends she made there ended up writing feature articles or interviews for us, or giving us major poetry sequences to publish. Although putting each issue together was never easy or uncomplicated, this Ottawa/Toronto-centric nature meant that we usually had a good framework of material ready (or at least in progress) when we started assembling an issue, which in turn meant that we were usually just trying to fill in holes or slots with work from other sources, and not trying to build each issue entirely from scratch. Q: You deliberately conceived of a full-sized journal distributed through CMPA over, say, a chapbook-sized photocopied journal distributed predominantly through small press fairs and hand-sales. What led to these decisions, and had you any models when you were shaping these decisions? Given you hadn’t any funding, what were the benefits and drawbacks to the format? A: There’s certainly an element of “what the hell were we thinking?” involved when I look back at Stuff. I’m glad that we did it – but I think that it was probably a good thing that we didn’t realize at the time how complicated, how expensive and how time consuming it was going to become as a project – because if we had, we might not have tried it... and that would have been a shame. We did it the way we did it because, I think, we had this very clear conception of Stuff as being not just a vehicle for literary work, but also a platform for an ongoing conversation about literary work and about the literary world. It seemed to us that there was enough scope in this concept that there might be an audience out there for it in the literary world beyond poetry zines and small press fairs. 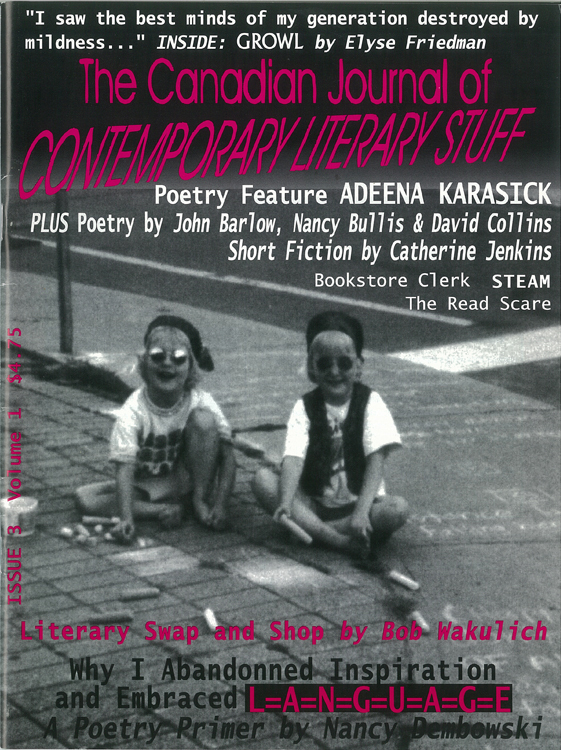 To find that audience though – to get beyond the folded-and-stapled-chapbook scene and to make it onto the racks at Chapters and magazine shops across the country – Stuff would pretty much by definition need to be a proper magazine. 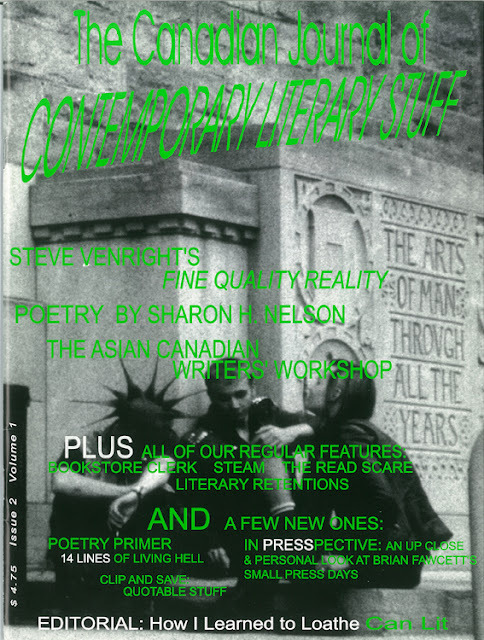 In terms of models, there were enough “real” literary magazines and journals out there that we knew we weren’t going to have to re-invent the wheel, and that in some sense, what we wanted to do was possible. Though I never really liked Broken Pencil much in terms of its approach, I did like the look of it, and it worked very well as a production model of what we were aiming for. I can’t recall if your Missing Jacket started before or after Stuff, but I think we were aware enough of your intentions for it for that to be a model as well. In spite of the fact that we knew Stuff was going to be expensive to produce, we decided right at the start that we weren’t going to aim for any funding for it. We had a very particular idea of what we wanted to do, and we didn’t want to have to dilute it in any way, adapt it to fit a funding model, or even to justify it to anyone. If it really was a valid concept, then we figured it would eventually succeed on its own – and if it turned out it wasn’t, then it wouldn’t, and probably shouldn’t. That said, I think we were still surprised by how much work and money we could sink into it without it being enough, and without making much in the way of forward progress. In hindsight of course, the idea that two people – one with a full-time job and the other trying to start her own business – could run something like this indefinitely on the scale we were aiming for was pretty absurd. With all of the tasks involved in getting an issue together – soliciting, reading & picking content, looking for advertising, marketing the magazine, actually laying out, producing and publishing the magazine – it didn’t matter what we did, there was always a long list of things that we didn’t have time to do. The frustrating thing is that the magazine was quite successful in terms of distribution and sales. We had a major commercial distributor right from the start, as well as a smaller but really quite good “alternative” distributor based out west, and by the 2nd issue we’d joined the CMPA (the Canadian Magazine Publishers Association, now called Magazines Canada). Although the CMPA turned out to be kind of a dud – and not just in terms of distribution – we had very good sell-through rates with the other two distributors and with the shops that we personally stocked the magazine in. Unfortunately, the economics of magazine publishing was such that even at the best of times, a copy that sold off the rack barely paid for the cost of its own production, and any copies that didn’t sell of course were a dead loss. We put as much time as we could into soliciting advertising and subscriptions, which is where we always knew the magazine would make it or break it. This turned out to be an even harder sell than we’d anticipated though – there was never enough time to do it properly, and neither of us were salespeople by nature. The ideal solution would have been to hire someone to do the ad-soliciting for us, but of course that would have required money, which we were already spending a lot of on production and everything else – and so it didn’t happen. In the end, although we were always improving issue-by-issue in terms of our sales and our paying ads, our costs kept increasing too – so we never managed to make any significant financial headway. Eventually, after four issues spread over three years, we decided that we just didn’t have the time or the financial resources to go any further, so we ended it there. Q: Through the four issues you produced, what do you feel you accomplished? What elements were unexpected? What had you hoped to accomplish but never quite got to? A: Looking back, I think we actually managed to accomplish exactly what we were intending to with Stuff in terms of what we printed, and I think we managed to accomplish it right from the first issue. We had good literary content – poetry and prose – we had good pieces about literary content, we had good columns, comment and comics which amounted to an ongoing and not entirely humourless conversation about things literary, and we were showcasing chapbooks and work from the small and micro press end of the literary world. I may well be remembering it all through a twenty-year-old rose-coloured haze, but I think we managed to do pretty much exactly what we were aiming to do, and in the tone we were aiming to do it. It did take us a couple of issues to find our feet in terms of the production end of things, but I think that right from the start we were putting out a very good product with very good content. The thing we didn’t accomplish, of course, was to have it succeed well enough fast enough to become a viable proposition... but as I said, in hindsight, given the way we went about it, it seems unlikely that that was ever a real possibility. Aside from simply being successful enough to continue, the one other thing that I know we desperately wanted to do – but never managed to do – was to be able to pay our writers. It was and is inexcusable when the writers, artists and creators of cultural content don’t get paid for their work – and if we could have just gotten into striking distance of breaking even with Stuff, paying our writers would have been the first thing we’d have spent money on... but we never even came close, and we both very much regret that part of it. Issue #1 (Spring 1997): Editorial: Tamara Fairchild & Grant Wilkins. Features: Jill Batson, bill bissett, Bob Wakulich, Catherine Jenkins. Regular Columns/Contributors: Chris Pollard, James Spyker, Valley Swooner, Johnny Steam, Tamara Fairchild. Poetry: Joe Blades, Donna Kane, rob mclennan, Catherine Jenkins, T. Anders Carson, Alix Smyth, Phlip Arima, Rob Winger, Rob Fairchild, Ruba Nadda. 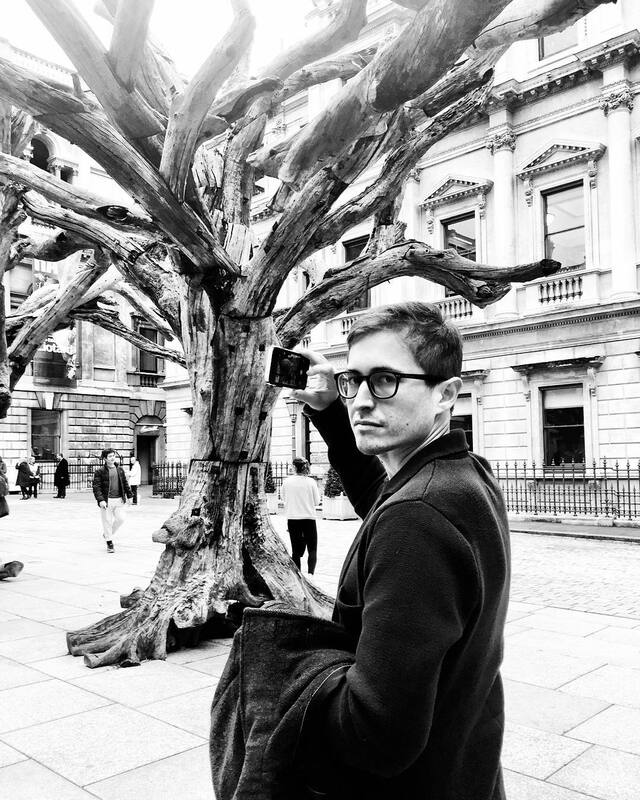 Fiction: Matthew Firth, Trevor Taylor, Gerald Noonan. Interview: Tamara Fairchild with Johnny Steam. Chapbook Excerpts: Stan Rogal, Natalie Hanna, una mcdonnell, James P McAuliffe. Reviews: Tamara Fairchild, Grant Wilkins. Proofreaders: James Spyker, Trevor Taylor. Cover photo: Richard Fairchild. 36 pages. Issue #2 (March 1998): Editorial: Tamara Fairchild. Features: Sharon H. Nelson, Charlie Cho, Bob Wakulich, Natalie Hanna. Regular Columns/Contributors: Chris Pollard, James Spyker, Valley Swooner, Tamara Fairchild. Poetry: LeRoy Gorman, Stan Rogal, Michelle Desbarats Fels, Sumana Sen-Bagchee, Dennis Dale Palubeski. Fiction: myrna garanis, J.J. Steinfeld. Interviews: James Spyker with Steve Venright, Lil Blume with Brian Fawcett. Reviews: Tamara Fairchild, Grant Wilkins. Proofreader: James Spyker. Cover photo: Catherine Jenkins. 36 pages. Issue #3 (October 1998): Editorial: Tamara Fairchild. Features: Nancy Dembowski, Adeena Karasick, Bob Wakulick. Regular Columns/Contributors: Chris Pollard, James Spyker, Valley Swooner, Trevor Taylor, Grant Wilkins. Poetry: Nancy Bullis, John Barlow, elyse friedman. Fiction: Catherine Jenkins. Chapbook Excerpts: David Collins. Cartoons: Andrew Toos. Reviews: Tamara Fairchild, Grant Wilkins. Proofreader: James Spyker. Cover photo: Tamara Fairchild. 32 pages. Issue # 4 (September 1999): Editorial: Tamara Fairchild. Features: Joanne Morcom, Paul Vermeersch. Regular Columns/Contributors: Christ Pollard, James Spyker, Valley Swooner, Grant Wilkins. Poetry: Jamie Gairns. Fiction: Douglas Ord. Contest Winners: Melanie Fogel, Shane Neilson, Alan Twigg, Dierdre Havrelock, Jean Leslie. Reviews: Sharon H. Nelson, Grant Wilkins. 32 pages. Andrew Wessels currently splits his time between Istanbul and Los Angeles. He has held fellowships from Poets & Writers and the Black Mountain Institute. Semi Circle, a chapbook of his translations of the Turkish poet Nurduran Duman, was published by Goodmorning Menagerie in 2016. His first book, published by 1913 Press, is A Turkish Dictionary. This is a question I’m still discovering, as the book is still in its early stages of release. My circumstances haven’t changed at all, but something emotional has. I’m both more relaxed (no longer worrying about finding the home for the first book) and more anxious (worried about whether people will read the book and find it interesting, worrying about my next projects). In the end, I’m finding myself in basically the same space: working every day, trying to write and read every day, and hoping to do something interesting in my work and my life. I’ve never really worried too much about genre, which I think probably comes across in A Turkish Dictionary. It’s a hybrid work that utilizes aspects of poetry, history, memoir, photography, travel narratives, and other forms. I didn’t really think about writing “poems” and I didn’t really think about writing “a collection of poems.” I really just thought about writing “a book” and this is the form that happened. Right now, the publishers that are open to this kind of work tend to classify themselves as poetry presses. And, in general, the poetry publishing world is more open to this multitude than other genres. So I don’t really concern myself too much with the classification, but I feel like the book is at home in this poetry world and at 1913 Press. I’m a slow worker. A Turkish Dictionary was crafted over about eight years of work. Four years to get to a first manuscript version, and then another four years of incremental editing and revision. Within that stretch of time, though, it’s common for the writing to come quickly. The initial version of the middle section of ATD was written in about a day and a half. That day and a half, though, came after months of reading, thinking, false starts, and abandoned attempts. And then it was followed by many more months of editing and revision. Looking back at that first full manuscript version, I think the same book is in there but it’s also changed fundamentally. Much of my work over the years has been as an editor for various literary magazines and presses, and I think I bring that approach to my writing: I create a cohesive draft and then edit it over and over and over again. ATD was a book-length work from my first conception and the first words I wrote. My initial idea ended up being very different than the final published version, but I had an image of a journey I wanted to take and the book was going to be the result of that journey. My two manuscripts-in-progress are similar: I have an idea that I want to investigate within a book-length space, and so I start writing in, about, and through it. I’ve written individual poems off and on, here and there, but my focus and interest has always lay in the book as a space of investigation. I just completed a little book tour where I read in California, Chicago, and along the east coast. Before that, I’d rarely read from the book—or done many readings at all. I always was reticent to seek out readings, feeling that I should present completed and published material. When asked, I would read, but I never sought them out on my own. I can be a bit of a perfectionist and eternal tinkerer with my work, so things never seem finished until the publisher literally takes it out of my hands and prints it up. As I say that, I also know that my favorite readings are when others are sharing in-progress work (like Trace Peterson’s amazing longer poem she shared in our reading at Berl’s). So there’s a distance between what I want to experience in the audience and what I’m willing to share of myself. I think I could describe the book as a search for a beginning, an attempt to find a concrete starting point. At times, I’ve called it the dark zero, which I think is a gravitational core of the book. In life there really are no firm beginnings, and the book reflects this. Everything is always preceded and followed, at best it’s a lineage and in reality everything is just another point on a nexus. I’m always wondering “how do I start? how do I start? where is the beginning?” and what I find through the book’s journey is that the search for a beginning is in and of itself sufficient, whether that’s the origins of language, of life, of one’s own life, of meaning, of understanding, of a culture or country. Those searches in the book take me through Istanbul’s streets, the histories of Istanbul and Turkey, dictionaries, encyclopedias, and arabesques. So it’s this ongoing question, and I think the book proposes that there isn’t an answer—and that an answer isn’t the point, anyway. This is a question I’m trying to figure out right now. I always considered myself an ongoing apprentice—practicing and training to become a “real” writer (whatever that means). And the book was the inflection point. When I had a book, then I’d move from writer-in-training to writer-in-the-world. So I’m seeing what that means now, and what my responsibilities are and should be. I recently wrote an article for Lit Hub, my first non-fiction essay that wasn’t a book review,about the current political situations in Istanbul and the United States, how they’ve affected my ability to live and find a home, and how to navigate all of that with the book coming out. 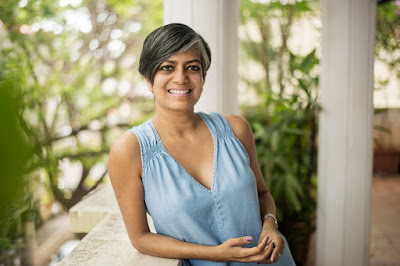 So I do think that a writer should be involved in the larger culture in some way, and I do feel compelled to do something that expands my literary voice and helps bring that literary work into a wider space, and vice versa to bring that wider space into my literary world. I’ve been lucky to find a number of mentors, friends, and confidants who have been essential in helping me see my work. And as an editor myself, I know the value that an additional set of eyes can be on a manuscript. It’s going to be an inherently difficult process, as these are works of deep and intense love. But I do also think it’s an essential and positive process, as painful as it can be in the moment. “Just hold on.” The expanses of time between beginning a writing project, finishing it, finding a publisher, and getting the printed book in hand are incredibly long and filled with rejection and failure. Early on my path, I was told by a mentor that success oftentimes just comes from hanging on long enough for the success to arrive. I’m not sure if one book is success, but it is at least a success. Reminding myself of that advice through the ups and downs of these years has helped me remain both persistent and patient, and along the way I’ve learned to trust myself, at least a little bit. 10 - How easy has it been for you to move between genres (your own poetry to collaboration to translation)? What do you see as the appeal? I see my poetry, collaboration, and translation as all part of the same whole, with one slight difference. When I’m writing my own work, it requires a total expenditure of all my time, focus, and energy. It’s all-consuming, which means that I also need to be in a specific space both physically and mentally to work through it. Collaboration and translation are creative works that I can perform in different mental spaces. When I collaborate (with Kelli Anne Noftle, as the author Steph Wall) I can write with a sense of play. Translation is a little bit different—it’s a combination of both creativity and labor. I can always sit down, even if I’m not able to create on my own, and do the “work” of translating and thinking about how to move a poem from one language to another. These activities keep my literary brain working, even when my own writing is stalled. I’m trying to figure this out right now. A few months ago, I moved back to the US from Istanbul. I had a routine set up there, but my work situation was different. As I set up my life again here in the States, I’m trying to figure out the best ways to carve out time to dedicate to writing and reading. The one constant is that I try to read something every day, and I try to write every day even if it’s just my 5-10 minute journaling session in the morning. I’ve found over the years that the more that I read, the more that I write. So if I can keep myself reading, I trust that the writing will find a way. I read and I walk and I travel. Those three things seem to feed my ability to produce writing. One of the bellwethers telling me I’m about to write is that I’ll start reading voraciously for a week or two. When I get into that headspace where I’m reading a few books a week and pulling books from my shelf with abandon, I know that my own writing is on its way. As I mentioned, in January my partner and I moved back to Los Angeles from Istanbul. The move has been a challenging one, as we were happy in Istanbul and building a home together there. It was a decision we felt forced to make; not one that we wanted to make. I’ve dreamed of the city and our home, which had a balcony overlooking the Bosporus, every night since we’ve moved back. While I didn’t grow up in Istanbul, this is the home that I’m thinking about most now, and missing the most. Just in front of our balcony was a fig tree that stretched up to our third-floor apartment. Our two summers and falls, I loved sitting on the balcony through the weeks and months and watching the fruits bud, grow, ripen, and finally be devoured by the birds. When I smell fig or a dark saltiness that reminds me of the Bosporus, I’m transported back. The first art form that I practiced was the piano, so musicality has always been important to me. But the form that I seek out the most now is visual art, though as a viewer more than a practicer. In particular, I love art that defies my ability to render it into language—paintings that force me to just stand, stare, and experience. Artworks that I don’t even want or care to explain, that make me feel like I just want to be totally enveloped by them. I’m going to list 10 writers, somewhat off the top of my head, that have been important to me both as a reader and a writer, both over a long span of time and more recently: W.G. Sebald, Ece Ayhan, Susan Howe, Bilge Karasu, Jena Osman, Nazim Hikmet, Rosmarie Waldrop, Solmaz Sharif, Juan Goytisolo, and Craig Santos Perez. As a writer, my primary goal right now is to complete and publish collections of translations of Nurduran Duman. As a person, one thing my partner and I have talked about a lot is spending a long stretch of time together in Spain and learning Spanish cooking. The natural or easy answer is to say that I’d be an editor, because it’s something I’m already doing. But to think beyond books and literature entirely—I’m really not sure. A lot of my work as a writer involves historical research, and I find myself constantly doing this kind of research even when I’m watching a movie. I always want to know the historical context that something exists within. So I’ll say I’d be a historian. As that last answer probably implies, I can’t think of doing much of anything else. The act of writing is a way of moving toward understanding. I often have difficulties verbalizing my exact thoughts and feelings. A spoken sentence seems to demand a more linear, conclusive statement than I can usually create about something. The written word, and more than that the open field of the blank page, allows for a complex and interconnected space where meanings can by multiplied. I recently finished a pair of translations of Turkish novels—Hasan Ali Toptas’s Reckless and Yusuf Atilgan’s Motherland Hotel—that were both beautiful and devastating. I’m never as good at picking movies, but a few weeks ago I watched Werner Herzog’s Into the Inferno, which was a strange but striking approach to volcanoes both scientifically and anthropologically, and the film made me return to his Cave of Forgotten Dreams. I’m enamored of that movie, if only because of a brief line of narration a few minutes into the film that Herzog gives as the crew approaches the cave for the first time: “From the first day of its discovery, the importance of the cave was immediately recognized, and access was shut off categorically.” I can’t get over that idea that the cave is so important that everyone must be prevented from ever seeing it. Right now, I’m primarily focused on translating Nurduran’s poems. She has a series called Neynur, which is a complex and challenging response to Rumi’s “Song of the Flute.” For English-language readers, I think it’s going to be a great opportunity to re-discover the depths and complexities of Rumi’s work that are often lost in many current translations. I’m also working with Nurduran on a separate collection of her poems in English. I have two manuscripts of my own I’m working on as well, though they’ve been mainly put on hold during my move and while A Turkish Dictionary is being released. One is a writing-through of Edmund Spenser’s The Faerie Queene, and the other is a book-length work thinking about philosophy of mind, neuroscience, and the self. I’m planning to return to both of these over the summer to see what they can become.